"Yinka Shonibare MBE's project space Guest Projects joins creative forces with London-based chefs to hold a series of sensory tingling supper clubs which will be much more than just a feast for the palate, but for the eyes, ears, imagination and beyond. The Artist Dining Room supper club at Guest Projects opens a space where creative minds can engage with the ideas of a well known artist through food. The first supperclub of 2014 kicks off with an evening inspired by the dot dabbled mind and work of Japanese native Yayoi Kusama. Guests will be lead on an exploratory evening of the artist, whilst special Guest Host Ayuko Sugiura leads an evening of visual theater and discovery. 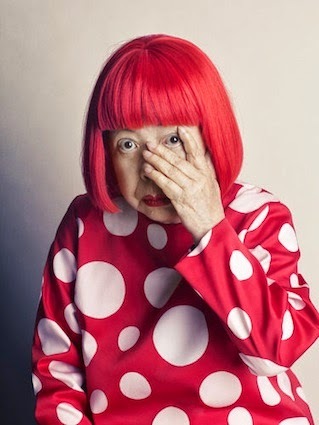 Born in Japan (1929), Yayoi Kusama has developed her practice for almost seventy years; exploring painting, drawing, collage, sculpture, performance, film, installation art, literature and fashion. The defining motifs of her art can be read as polka dots, which have their roots in hallucinations Kusama has suffered from since childhood. Her work shares affiliations with Surrealism, Minimalism, Pop art, Eccentric Abstraction and Feminist art, being show throughout the world, notably at major touring retrospective in 2011-12 at Museo Nacional Centro de Arte Reina Sofía, Madrid; Centre Pompidou, Paris; Tate Modern, London; and Whitney Museum of American Art, New York."